Filson is a Seattle-based company that manufactures leather bags, clothing, and accessories for outdoor enthusiasts. The company is known for its high quality adventure apparel for activities such as hunting, fly fishing and sport shooting. With Big Apple Buddy’s personal shopping service, you can now buy direct from the USA Filson online store anytime, anywhere. Filson’s accessories and clothing are perfect for outdoors lovers, but can also be worn for everyday use. 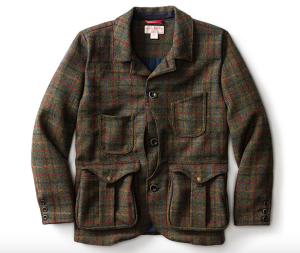 Their Guide Work Jacket, a classic tweed jacket with expandable pockets, comes in a brown, gold, and blue plaid design. This rain-resistant jacket is designed primarily to be used when shooting/hunting, and its expandable pockets are ideal for storing shells. For those looking to keep their electronics safe during outdoor adventures, Filson’s Photographer’s Backpack is a great choice. Its hidden zippers and internal padding provides secure storage for valuables like laptops and cameras, while its wool-lined shoulder pads ensure maximum comfort. 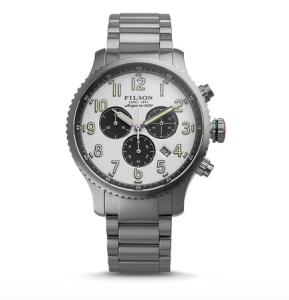 Filson also offers its own exclusive brand of watches. Assembled by hand in a Detroit factory, these watches are designed to withstand use in the field. The Mackinaw Field Chrono Watch has a stainless steel bracelet and scratch-resistant, anti-glare surface. Whether this watch is worn for everyday use or out in the field, it is designed to last a lifetime. 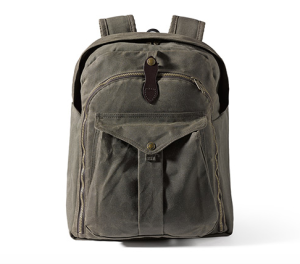 Unfortunately, the USA Filson online store currently only ships to select countries. However, Big Apple Buddy, your personal shopper, can help you buy products direct from the official Filson online store and ship them to your doorstep, no matter where you are in the world. We offer international shipping to over 110 countries including Australia, Austria, Azerbaijan, Bahrain, Belgium, British Virgin Islands, Brunei, Bulgaria, Canada, Chile, Costa Rica, Croatia, Czech Republic, Denmark, Estonia, Fiji, Finland, France, French Polynesia, Germany, Gibraltar, Greece, Greenland, Hong Kong, Hungary, Iceland, Indonesia, Ireland, Israel, Italy, Japan, Jordan, Kuwait, Latvia, Liechtenstein, Lithuania, Luxembourg, Macau, Malaysia, Maldives, Malta, Marshall Islands, Mauritius, Monaco, the Netherlands, Netherland Antilles, New Zealand, Norway, Oman, Poland, Qatar, Romania, San Marino, Saudi Arabia, Serbia and Montenegro, Seychelles, Singapore, Slovak Republic, Slovenia, Spain, South Africa, St. Lucia, Sweden, Switzerland, Taiwan, Thailand, the UAE, the UK, Vatican City, and Vietnam. If you would like to buy from the USA Filson online store, simply let us know which items you would like to order (by filling out the form below) and we’ll get back to you with a free international shipping quote within 24 hours!